It’s hard for me to swallow the fact that my baby is turning 4 next month. And even if I wanted to forget about it, Cole won’t let me. Each day he talks to me about something regarding his birthday – be it another amendment to his birthday invite list or a toy to add to the Birthday Wish List. One thing he asked to do this year was create a “Birthday Bucket” at our local Learning Express. We had gotten something for Julie‘s son out of his birthday bucket back in August and Cole asked to do one for his own birthday. I’m not sure how many people we’ll actually tell about the birthday bucket (other than you all) as I hate to presume that someone would feel the need to pick something out of the bucket. But I realized there was value in making a bucket for two main reasons: it gave me great insight into what he’s into these days (sometimes the lines between what he wants and what his older brother wants get blurred) and I will receive 20% off anything out of his bucket after Cole’s party is over. My First Science Kit – $19.99 – I was excited to see this Kit is made for children ages 4+. While I’m sure this will be one big mess in my house, I know he’ll love mixing up the various colors in the test tubes and playing with the crystals. 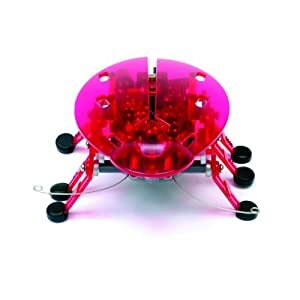 Ultra Stop Rocket – $16.99 – we’ve had various rocket kits in our backyard before and it never gets old. The whole smashing and launching a rocket up into the air always provides my boys with hours of entertainment. He was quick to put this in his bucket. My kids loved their Butterfly Garden from Insect Lore that we used this summer. They watched as caterpillars turned into butterflies and then released them at the Jersey shore. It was a great experience which Cole remembered. He was quick to put the Ladybug Land from Insect Lore into his bucket in the hope that it will be as fun to watch as the Butterfly Garden was. 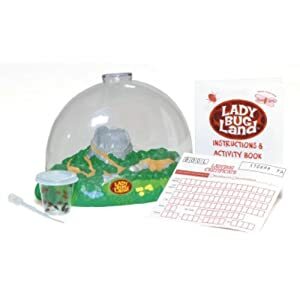 You can get the Ladybug Land for $15.54 on Amazon with free shipping.